Welcome to our Blog. Watch this space for our latest news, articles and information. ​Hillhead 2016 saw the international launch for a new line of attachments and demolition tools from world-leading hydraulic rockbreaker brand, Rammer. The attachments include Cutter-Crushers, Scrap Shears, Rotating and Static Pulverizers. The new line demolition tools have been designed to meet the specific and ever-changing needs of this demanding industry and provide greater versatility, enhanced productivity, improved wear resistance and simplified maintenance. The new Rammer Cutter-Crusher (RCC) range is manufactured from wear resistant HB400 steel for a longer life and feature (except RCC04R) a chamfered jaw design for greater penetration, a speed valve and desynchronized jaws for more precise placement and faster cycle times. This system is covered by hydraulic rotation valve protection for longer motor life and reduced owning and operating costs. As a further nod towards system protection, the larger RCC models all feature forged and fully protected cylinder rods, heat-treated pins as well as bushes for a longer low maintenance life. Integrated oil filters help protect the boosters from impurities in the hydraulic oil, while a regeneration and cleaning oil distributor maintains pressure at the required level, avoiding pressure peaks as well as reducing maintenance costs. 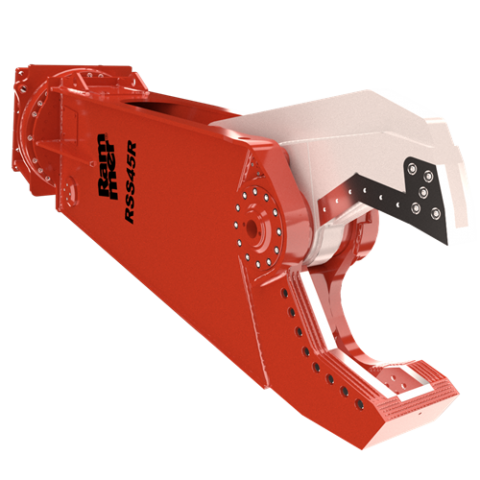 The Rammer Scrap Shear (RSS) line-up is designed to withstand even the harshest of demolition environments. Comprising nine models that are suitable for carriers in the 2.0 to 60 tons operating weight range, the Rammer Scrap Shears are also manufactured from HB400 steel for optimum wear resistance and a long working life. They also share the same hydraulic rotation, rotation protection, heat-treated pins and bushes, and weld-free cylinder rods found on the Rammer Cutter-Crusher range. All the new models feature a speed valve for improved cycle times and a smart jaw design that allows material to fall away from the cutting area, enhancing performance and increasing uptime. A double guide helps ensure excellent cutting jaw alignment for better cutting delivering lower owning and operating costs. A central pin adjustment system also helps prevent jaw deviation to maintain maximum cutting performance. This system is also proven to reduce operating costs by minimizing the amount of material struck between the jaws. To further minimize owning and operating costs, each unit features cutting blades that have four usable sides that can be reversed. Tips can be replaced without welding to maintain high productivity levels. Rammer is further demonstrating its commitment to customers in the demolition business with the launch of the new RPV Series of Rotating Pulverizers which comprises of four models that are suitable for carriers in the 10 to 45 tons operating weight class. Like the other Rammer demolition tools, the RPV Series is manufactured from HB400 steel, featuring heat-treated pins and bushes for a long service life. A full hydraulic rotation, which is protected by a rotation protection system, facilitates more precise alignment for faster cycle times and greater productivity. A speed valve system reduces cycle times for greater productivity, and helps reduce stress on the hydraulic components, extending their life and reducing owning costs. The RPV jaws are designed to allow crushed material to escape from the crushing area, reducing clogging, minimizing maintenance and increasing productivity. The RPV Series has also been designed for simplified maintenance, with easy access to key components. Cutting blades and wear parts can be changed on-site without special tooling to return the Pulverizer to factory specifications. RPV range of Static Pulverizers which consists of six models with operating weights from 150 to 4,200 kg. These are suitable for carriers in the 1.5 to 45 tons operating weight class. These new models share all the features of the RPV Series, aside from the hydraulic rotation, and provide an affordable yet high quality alternative. To complete the new line of Rammer demolition tools the Rammer range of RMP Multiprocessors and RGP Grapples will be launched in a near future.